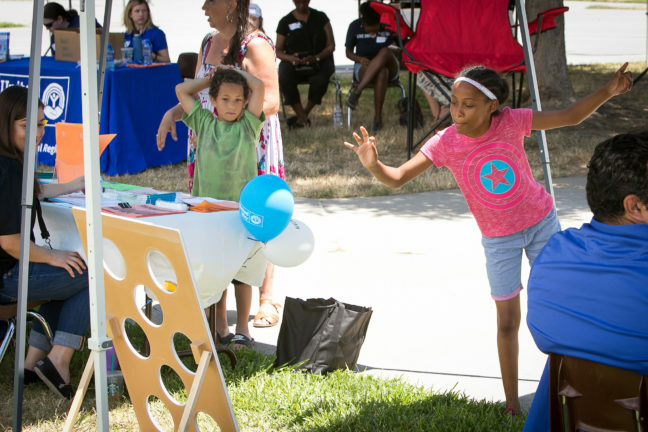 Dozens of North Sacramento residents attended a free community celebration at Robertson Community Center on June 11 to kick off United Way’s free summer meals program for kids. The event, which was cohosted by Mutual Assistance Network, included family games and activities. Davis Joint Unified School District Nutrition Services provided barbecue to celebrate its partnership with United Way to provide free meals each weekday at various community sites so kids have enough to eat during the summer months when they are out of school. Sacramento Food Bank and Family Services distributed free produce at the event. To find a list of sites where summer meals will be served, text FOOD or COMIDA to 877-877 or call 2-1-1. United Way believes education is key to breaking the cycle of poverty, and a healthy body is key to learning. Bray says kids in the capital region who graduate from college are 62 percent less likely to live in poverty than those who drop out of high school. So United Way is working with partners to increase the number of students who graduate from high school prepared for success in higher education. Bray says summer meals and learning opportunities are key. “With bellies full of healthy food, and brains full of fun learning activities, kids will return to school in the fall ready to keep learning,” Bray said. For more than 90 years, United Way California Capital Region has brought people together to meet pressing needs in the Sacramento region and has changed the lives of hundreds of children, families and adults in Amador, El Dorado, Sacramento, Placer and Yolo counties. Now the nonprofit is focusing on ending poverty through education by helping kids meet important educational milestones from kindergarten to career. To donate or volunteer, visit www.yourlocalunitedway.org.